A varied circular which starts and finishes at The Woodman, Wildhill. 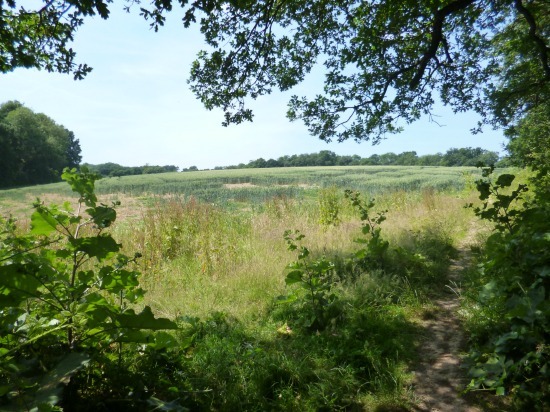 The route takes you through the Cartland Estate, a hornbeam wood, along quiet lanes and tracks with open views, and across fields. This walk does involve a short five minute stretch walking along a country lane without a footpath. Park at The Woodman, Wildhill. Leave the car park and turn left and then first right up West End Lane. The lane dips down then climbs before turning right and left. Shortly after the left turn take the byway on your right. This is Essendon byway open to all traffic 14 (BOAT). Follow this byway through the woods until you reach a gate on the right after about half a mile. Go through the gate and take the footpath (Essendon footpath 16) down to the stream with the field on your right and the hedgerow on your left. Cross the footbridge and continue walking south-east through the woods until you reach a footpath junction. Here you turn right and follow the footpath (Essendon footpath 15) through the Cartland Estate eventually emerging on the B158. Cross the road, and carry on down Hornbeam Lane (Essendon bridleway 18) passing the houses on your right until the lane narrows and becomes a track. Continue along this bridleway climbing the hill through an avenue of hornbeams until you reach to Cucumber Lane. Turn right and continue along Cucumber Lane until you come to the junction of Woodfield Lane and Tylers Causeway. Turn left at the junction and continue east along Tylers Causeway for a few yards until you reach a track (Hatfield restricted byway 88) on your right. Take the track and walk past a lodge on your left and a bungalow on your right. Shortly after passing the bungalow look out for a public bridleway (Hatfield bridleway 87) on your right. Take this bridleway for 1.5 miles until you reach the B158 again. Cross the road and continue along Grubbs Lane. Take care as the lane dips (see red warning sign on map) because there is no footpath for about five minutes of the walk. Walk single file at this point on the left hand (south) side of the road. 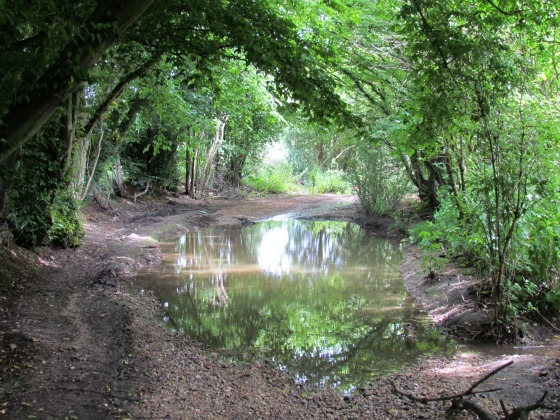 Shortly after the lane dips and rises again you will see a public footpath on your right (Hatfield footpath 84). Take this path and cross the field until you reach a hedge. You will notice the path cuts through the crops and then turns slightly right and heads north with the field on your right and the hedgerow on your left. At the bottom of the field you will see a gap in the hedgerow to your right. Go through the gap, cross a small stream, turn left, and follow the path round with the hedge on your left and the field on your right. At the fourth oak tree on your left you will see steps down to a gate. Go through the gate, cross a small footbridge, cross another field, go through another gate, across another footbridge, another gate and emerge in The Woodman car park. 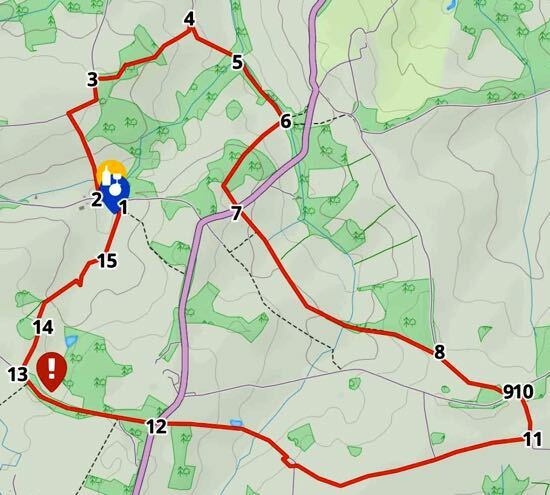 There is also a map showing the start points for all our walks. You can find out more about who is behind this site by visiting our about page.